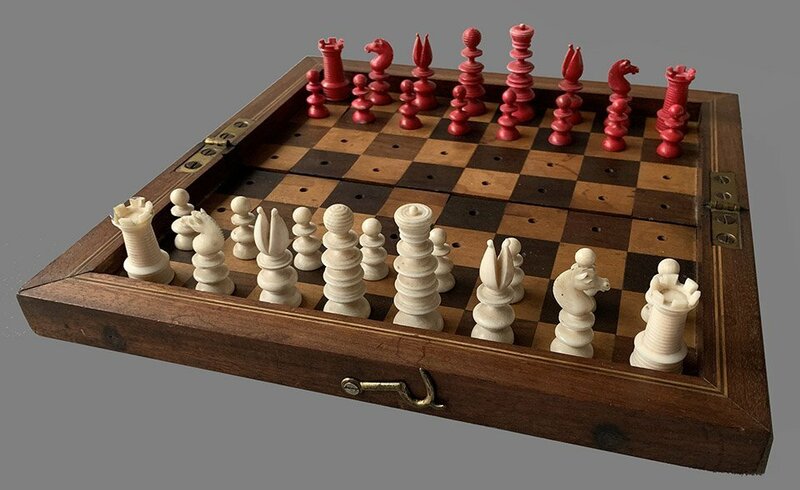 Portable Jaques Saint George Chess Set. 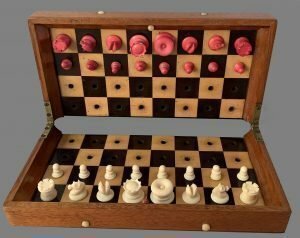 An early Victorian Portable Jaques Saint George Chess Set. 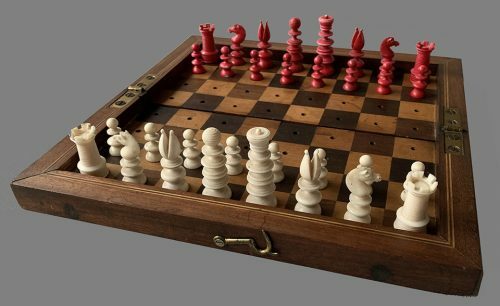 The pegged chessmen are natural and red-stained. The King stands 2″ tall with a 3/4″ diameter base. 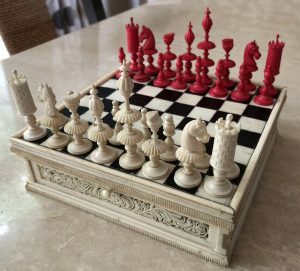 The pieces are quite broad for a travel set, masterfully turned and feature massive, full-tower Rooks and beautifully carved Knights in the unmistakable Jaques Pre-Staunton style. 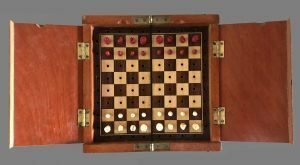 The accompanying folding chessboard is Mahogany measuring 10″ square open with 1-0″ Rosewood and Satinwood squares. 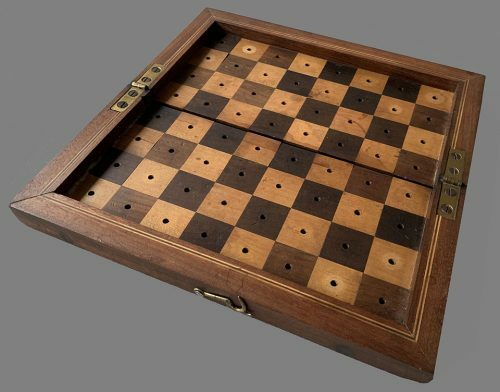 The removable piece that mounts into the chessboard to prevent the chessmen from falling out when the pieces are stored and the board/box is folded is missing. The set is complete and in excellent condition. 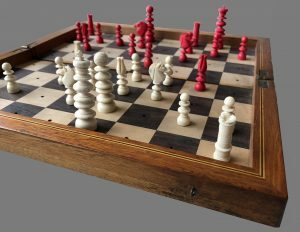 The Portable Jaques Saint George Chess Sets were produced by from around 1840 until the end of the Victorian Period. 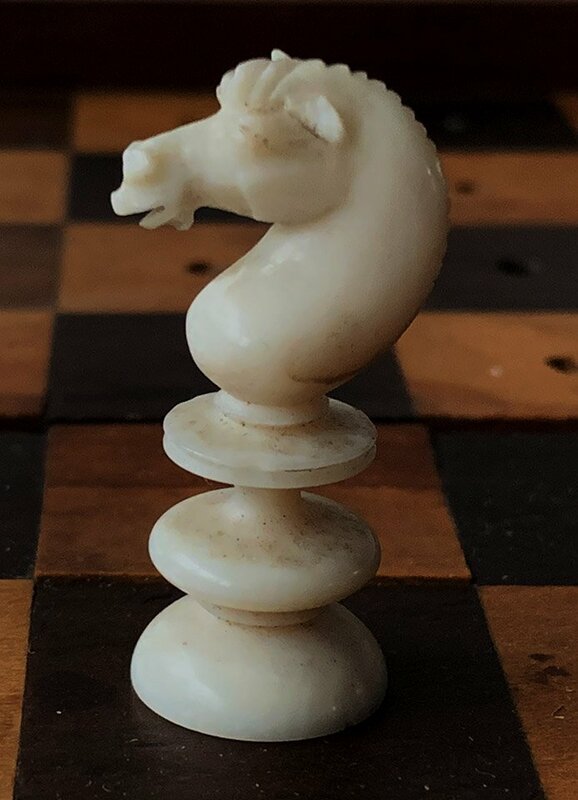 This is perhaps the finest Portable Jaques Saint George Chess Set I have encountered in my 35 years collecting antique Victorian chess sets. For more information and background on the firm of John Jaques, please click here. 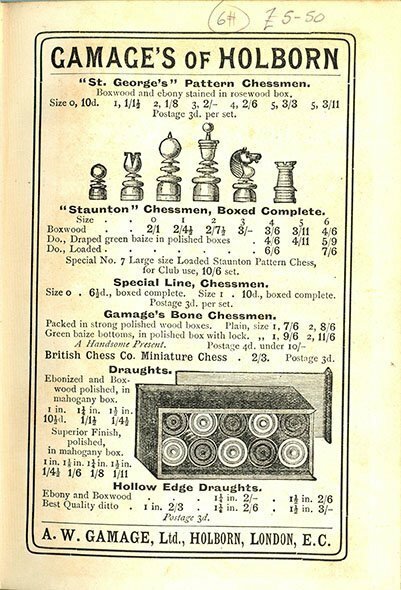 The Saint George pattern is a derivative of the ubiquitous English Pattern Playing Chess Sets. 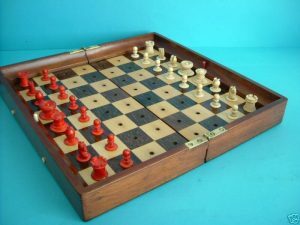 This is a very playable design which has survived well into the 20th Century. 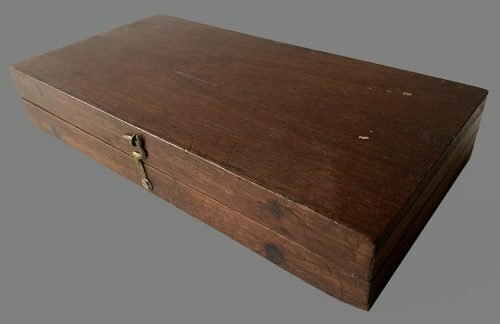 They are available in a multitude of sizes, qualities and materials, including several wood species, bone, ivory, stone, Bakelite and even metal. 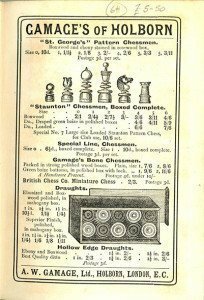 During the Victorian period, Saint George Travel Chess Sets were produced by almost all the known manufacturers, including John Calvert, F. A. Ayers, William and Thomas Lund, George Merrifield and Dixon, among others.